WELCOME TO MY MONEY MISSION ONLINE: SUPER SENSATIONAL SATURDAY GIVEAWAYS AND FREEBIES! 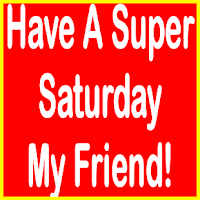 SUPER SENSATIONAL SATURDAY GIVEAWAYS AND FREEBIES! Saturday Morning! Finally! I was really tired, because we got home late last night from the game (teen son played in the band). The team lost, by the way, so that was kind of a downer. But, oh well, the band sounded good! Dawna over at a kiss and a peck is having a $10.00 Walmart giveaway. Mandy over at steals and deals is having a U Printing 500 Business Cards Giveaway, Write Way to Learn giveaway, Mark-my-time giveaway, and a Happy Chickadee Leg Warmers Giveaway! Tara over at Tara's view of the world is offering a Trend Micro Internet Security 2010 GIVEAWAY!! FREE Precious Places DVD- Available Again! There's lots more out there in bloggy world....if you have one that you'd like to see added to my list, just comment and let me know!